Hello again everyone! I hope you all had a wonderful Christmas and are as excited for the start of 2013 as I am! I wore this outfit for a family meal on Christmas Eve Eve - I wore pretty much the same outfit on Christmas Day, but swapped the jeans for a black skater skirt and tights! I absolutely love this shirt and it was perfect for over Christmas - warm, cosy, comfortable, capable of hiding a food baby, and a little bit festive. I'm planning on hitting the sales up in town tomorrow with my mum - what shops would you recommend? Where should we avoid? Hopefully I'll get some good bargains to share with you over the next few days! That velvet top is superb! Love the Velvet Shirt! I haven't been sales shopping yet but i can imagine Topshop and Primark being really crowded! But still go their because they always have good sales on! I am jealous! I've been looking for a velvet shirt in charity shops for as long as I can remember and never found one as perfect as yours, good find. I love the colour of it! 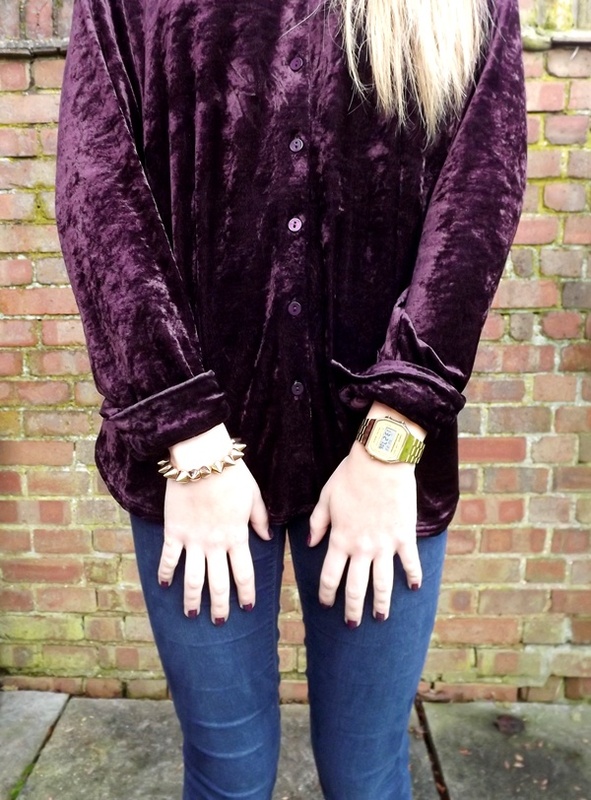 I love velvet, this shirt it gorgeous! This shirt is amazing! Looks fab on you! Love that shirt! Stunning piece!! Ooh, what lovely shirt! I have a purple velvet one too... I might be inspired to post an OOTD too.